Various secondary sources such as such as Factiva, Hoovers, Manta, and others have been used to understand and gain insights into the global fiberglass fabric market. 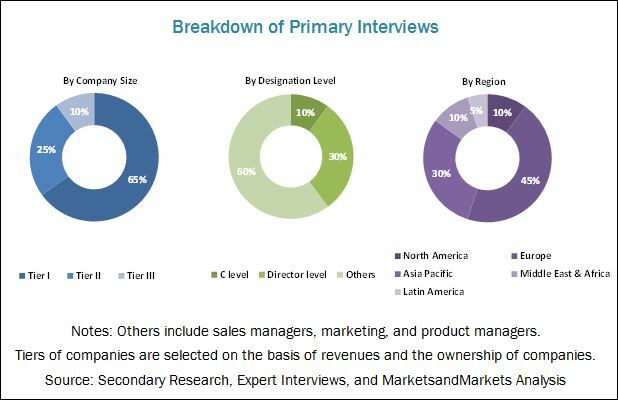 Experts from top fiberglass fabric companies have been interviewed to verify and collect critical information and to assess trends in the fiberglass fabric market during the forecast period. The top-down, bottom up and data triangulation approaches have been implemented to calculate the exact values of the overall parent and individual market sizes. The market for fiberglass fabric has a diversified and established ecosystem of upstream players such as raw material suppliers and downstream stakeholders such as manufacturers, vendors, end users, and government organizations. Some of the major players in the fiberglass fabric market are Owens Corning (US), Gurit (Switzerland), Jushi Group Co., Ltd. (China), Chomarat Textile Industries (France), Saertex GmbH & Co.KG. (Germany), Tah Tong Textile Co., Ltd (China), Auburn Manufacturing, Inc. (US), BGF Industries, Inc. (US), Nitto Boseki Co., Ltd. (Japan), and Taiwan Electric Insulator Co., Ltd. (China), among others. “This study answers several questions for stakeholders, primarily which market segments they need to focus upon during the next two to five years to prioritize their efforts and investments”. 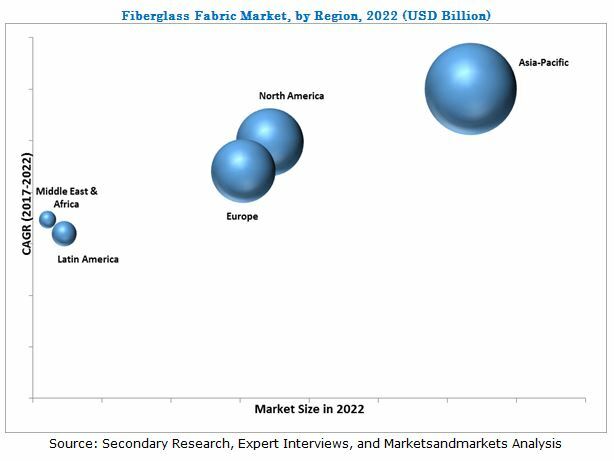 This research report categorizes the fiberglass fabric market based on fiber type, fabric type, application, and region, and forecasts revenue growth and analyzes trends in each of the submarkets. The global fiberglass fabric market, in terms of value, is projected to reach USD 13.48 Billion by 2022, at a CAGR of 7.62% between 2017 and 2022. The increasing demand for fiberglass fabrics in applications demanding high performance properties and various business strategies such as agreements, expansions & investments, acquisitions, and new product developments undertaken by the key players in this market are the major factors contributing to the growth of the global fiberglass fabric market. The segmentation considered for the global fiberglass fabric market is by fiber type, fabric type, application, and region. Fiber type is further segmented into E-glass and others. E-glass fabric is the fastest-growing segment, as it has the highest demand from various end-use applications due to its superior properties and cost efficiency. The various end-use applications such as wind energy, transportation, construction, and electrical & electronics, among others demand high consumption of E-glass as this fiber offers high strength, is lightweight, corrosion resistant, has better insulation properties, and also is lower in cost compared to other fibers. The major applications of fiberglass fabric are wind energy, transportation, electrical & electronics, marine, construction, aerospace & defense, and others. Wind energy is projected to be the fastest-growing application in the global fiberglass fabric market between 2017 and 2022. This is attributed to the high demand for fiberglass fabrics in the manufacture of several structural parts of wind turbines. The fiberglass fabric used in wind turbine structural parts, offers high strength and lightweight properties along with high corrosion resistance. Also, the wind energy market is estimated to grow in the future due to the rising demand for clean energy across the globe. This is expected to positively impact the demand for fiberglass fabric in the wind energy application. The Asia Pacific was the largest fiberglass fabric market in terms of value in 2016. This growth is attributed to the high demand for fiberglass fabric in wind energy and electrical & electronics applications. The wind energy and electrical & electronics market is growing at a high rate in the Asia Pacific region. The major countries namely China, Japan, and India are focusing on energy generation through renewable sources and thus, demand for fiberglass fabrics for the manufacture of several structural parts of the wind turbine is expected to rise in the Asia Pacific region during the forecast period. Also, the Asia Pacific is a hub for the electrical & electronics industry with China being the leader in this region. The demand for fiberglass fabrics for the manufacture of PCBs is another driver in the growth of the fiberglass fabric market in the Asia Pacific region. The increased demand for fiberglass fabrics in wind energy and electrical & electronics applications is leading to the growth of the fiberglass fabric market. The manufacture of fiberglass fabrics is capital intensive and hence a major restraint in the growth of the fiberglass fabric market. Owens Corning (US) is one of the major manufacturers of fiberglass fabrics, and emphasizes excellence in consumer-centric product creation and focuses majorly on new product launches, acquisitions, investments, and expansions. The company is involved in steady improvements in several business areas, and follows strategic moves to sustain its position as a market leader. 5.1.4.1 Uncertain Wind Energy Market in the U.S.
11.3 Jushi Group Co., Ltd.
11.5 Saertex GmbH & Co.Kg. 11.8 Tah Tong Textile Co. Ltd.
11.11 Nitto Boseki Co., Ltd.
11.13.3 Central Glass Co., Ltd.
11.13.13 Fulltech Fiber Glass Corp.